A new report from the National Audit Office has revealed that the cancellations of electrification announced in July last year were caused mainly by a lack of funding, and not to avoid ‘disruption’, as was claimed at the time. 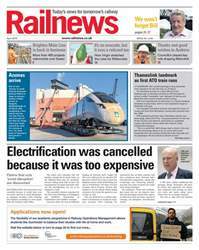 The Railnews feature for April considers the state of electrification projects in the wake of the NAO findings. The contest to run the next Intercity West Coast franchise was stepped up by the Department for Transport on 27 March with a formal invitation to tender for three shortlisted bidders, while it has been revealed that the DfT has needed an additional £60 million from the Treasury to balance its books for franchises in the current financial year, saying that industrial action is partly to blame. More industrial action was staged by the RMT in March in the disputes over driver-only operation. However, there were signs of progress on Merseyrail in early April. Network Rail has issued a ‘start warning’ to HGV drivers and operators after the Whitby branch was closed for four days from 12 March because a skip wagon struck a bridge. A Thameslink train carried passengers using Automatic Train Operation for the first time in March. The landmark journey from Peterborough switched to ATO through central London. Five more trains have been ordered by Transport for London for the Elizabeth Line, taking the total size of the future fleet to 70. They will be built by Bombardier in Derby. The Easter weekend marked another surge of activity as 15,000 Network Rail people were kept busy achieving a £118 million upgrade of the railway network, amounting to more than 400 projects. In Hot Topic, Sim Harris explores the implications of allowing delayed passengers to claim ‘consequential’ losses, and what the effect could be on railway finances. Finally, the industry was saddened to hear that the ‘railway baronet’ Sir William McAlpine has died, aged 82. Tributes to his generous support for almost countless projects have poured in.